Originally from Brazil, Rod has played in several bands of various kind of music from pop to dance, electronic and heavy metal. Rod Rodrigues was born in Bragança Paulista, Brazil. His interest in music came from his mother, who played the guitar and sang in the famous “Family Barbecues” music group. He started studying guitar at age 12, and some years later started to study with some of the best guitar players in Brazil: Edu Ardanuy, Mozart Mello, Kiko Loureiro (Megadeth), André Hernandes and others. In 2002 he graduated in Rock Specialization by EM & T (Music and Technology School in São Paulo, Brazil). He currently holds a Bachelor’s degree in Music from the Claretiano University and has taken several online courses from outside institutions such as Berklee College of Music (US), University of Edinburgh (Scotland), Yale University (US) and University of Rochester (US). His experience as a teacher began 20 years ago, and since then he has taught at several schools. In 2014 he had the opportunity to do some works in Europe, among them, to teach at Music Action School in Hamme Mille, Belgium. He has participated in jam sessions with several European musicians and did volunteer work giving a music clinic at the École Bois de Chènes, children school in Coisins, Switzerland. As a practical musician, he has played in several bands of various kind of music, from pop to dance, electronic and heavy metal. He has recorded with the singers Ricardo Parronchi, Michael Matt, Henry Ayres, Bella Guima, and others. In 2010 he released his instrumental EP titled “The First Step: Introduction”, with special guests André Hernandes, bass player Andrei Ivanovic, and drummer Richard Montano (Nuno Mindelis, J.J. Jackson). Acclaimed by the Brazilian music press, “The First Step: Introduction” featured prominently in the Guitar Player and Guitarload magazine and has been featured in a number of guitarist collections. His music “102 Degrees” was the soundtrack of the Brazilian TV show Conexão Radical on TV Altiora. His song “Searching for New Vibes” was featured on the Jason Becker’s Tribute CD titled “Heart of Hero. In 2016 he released his E-Book “Guitar Shred” (portuguese version), and very soon the English version will be available on sale on his website. Besides his activity as a guitar teacher, R.R. 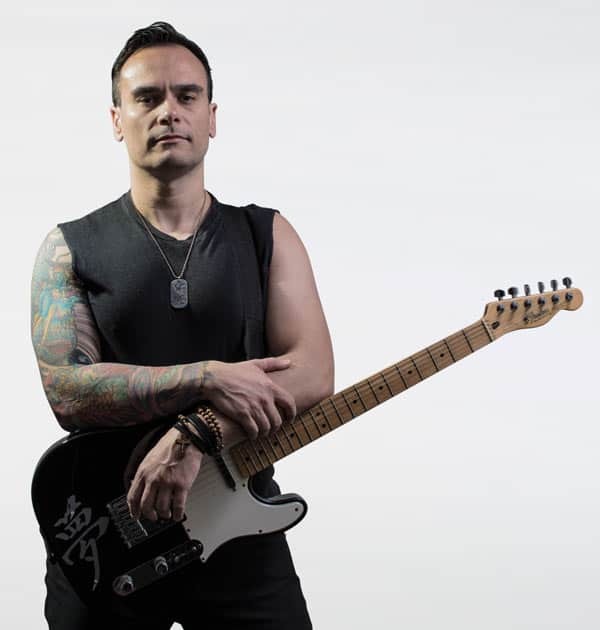 was the guitarist, main composer and producer of the Thrash / Death / Prog metal band called Enemies of Reality, that released in 2016 the EP titled “Trull”. In addition to that band, he was also a member of the band “Falling Into a Dream”, a tribute to Dream Theater. Listen to Rod Play Guitar!